Smooth muscle is made up of cells that contain a single central nucleus. The cells stick together and are connected by specialised cell junctions, called gap junctions. The cells are spindle shaped, and the nucleus is central. This diagram shows a few of the cells that can be seen in the stained section below. Look at this section of smooth muscle, which shows smooth muscle cells both in longitudinal section (LS) and in transverse section (TS). Compare this to the diagram above, and make sure you can recognise smooth muscle cells in TS and LS. The cells do not have a striated appearance. This is because the actin and myosin in these muscles is more randomly arranged. Look at this scanning EM of smooth muscle from the urinary bladder of a guinea pig. Scale bar: 50 mm. 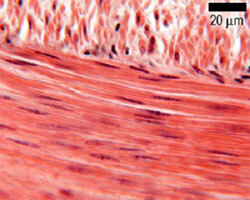 It shows bundles of smooth muscle fibres. There are many functions of smooth muscle, from moving food along the digestive tract, to pulling hair erect in response to cold or fear. When these cells contract, they squeeze the ducts, helping to extrude the contents. Look at this section of ducts, that are surrounded by myo-epithelial cells. 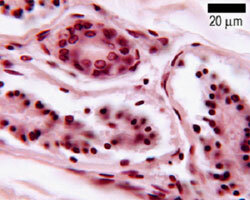 The myoepithelial cells are very thin, and have dense flattened nuclei. The position of the myoepithelial cells around the duct is outlined in the diagram below.